Sticky board 2 is an excellent whiteboard and sticky-notes app to use on your iPad. This app is now free for a limited period of time. 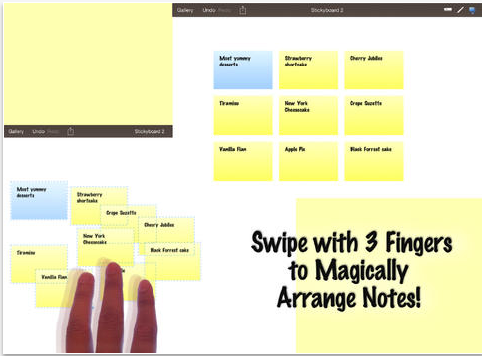 Using Stickyboard 2 will enable you to record your notes into digital sticky notes using any color coding system you like. You can easily move around your notes, group them together and arrange them into boards. You can share your whole boards with your friends via email as PDF files. Easily manage multiple boards and quickly switch between them with the gallery view. The ink system in Stickyboard 2 is much improved over its predecessor. It supports multiple colors with stutter-free drawing. Undo/redo works with notes and ink, just as you would expect. Tap on selected notes to copy/cut them, even to other boards. 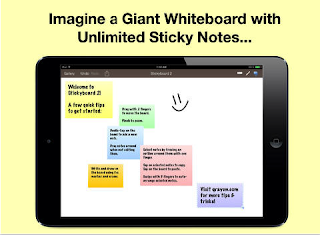 Working with large amounts of information is easy with Stickyboard 2.